It's better to stop and reflect than lead a life you don't like. A recent LinkedIn survey of 2,000 25 to 33-year-olds found that 72 percent had experienced a quarter-life crisis—something Ben Edwards of BE Limitless describes as "feeling like you have to make changes to eliminate dissatisfaction." If you are questioning your choices and wondering what your future holds, don't panic: a quarter-life crisis doesn't have to be a bad thing. Here's what five life coaches have to say about why reassessing your life in your 20s can actually be a good thing. Different parts of your life have to come to an end. "When we're very young, 30 seems ridiculously old and we have all these images of what we'll be doing at what age, even if we don't actually verbalize them", Stephanie Varda, a life coach specializing in stress and image management, explains. "But as we approach that age we can start to panic a little about where we are versus that picture in our head." "The quarter-life crisis is about finishing a big part of your life, which was mostly studying and discovering who you are, and excitement and fear about moving onto the next part." And that's a totally natural feeling. You can't build a house on top of the old one. Business mentor coach Sarupa Shah says you can't create new and exciting plans, without waving goodbye to old ones. "Meltdowns aren't obligatory", she says. "Though [it] can be incredibly helpful catalysts for life change. You can't build a house on top of the old one: the old one has to crumble and be removed for a new foundation to be laid. Don't see a meltdown of any circumstance as a failure. See it as fuel for change." Things always change. You were never going to follow one path forever. Don't see your "quarter-life crisis" as a massive deal. Life is forever changing, and this is just a moment of reflection in yours. As Sarupa adds, "Life is always fluid. We are always changing, growing, and expanding our sense of self. It's really about getting to the heart of who you are and where you excel, discovering the stories, habits, and patterns you cling on to that may be limiting your potential." There aren't rules about these things. You can pack in your life and do something different. But Sarupa does advise a bit of "good old-fashioned planning," noting: "Not everyone makes this decision overnight and flourishes. Hold your nerve as people around you, [like your] friends and family, may offer you conflicting, contradictory, and pretty poor advice. Often it is based on their own unrequited dreams about their life and what they believe possible, probable, and logical for them." "If this is such a strong urge, taking a year or two out is a wonderful thing. Packing [in] your life isn't about leaving behind loved ones." Whenever you slow down, you eventually speed up the right things. "Up until now, you've been the bright young thing with something to prove," Natasha McCreesh founder of PIP to Grow Strong says of your late 20s. "Except you've been so busy proving your worth that you've probably forgotten what your worth is." "Being busy gets in the way of progress and it's the toxic companion that sleepwalks you through life. It's okay to slow down and create space for fresh ideas. When you slow down it's easier to make clean decisions, so that you get where you truly want to be, faster." A change of direction means getting closer to the real you. "All that confusion you're feeling is because you are actually getting closer to knowing who you are and what you want," Natasha continues. "You've had a quarter century at this now, and it's time to trust your instincts." "If you feel confused about a situation or a person, generally it means they are not for you, and it's time to get out! At the same time, notice when you feel in flow, notice when a conversation is energizing and what you are doing or who you are with." Don't freak out about letting go of old habits. Olga Levancuka, the author of How To Be Selfish, says you don't have to freak out about letting go of childhood friendships—people change a lot between 18 and 25. "The friends we make as teenagers or as young adults don't necessarily meet our needs as we grow older. If you feel that someone isn't supportive of you or has turned toxic, you need to let go. Cutting people out of your life may be tricky, but it's really important to surround yourself with the best possible people who make you feel good about yourself." 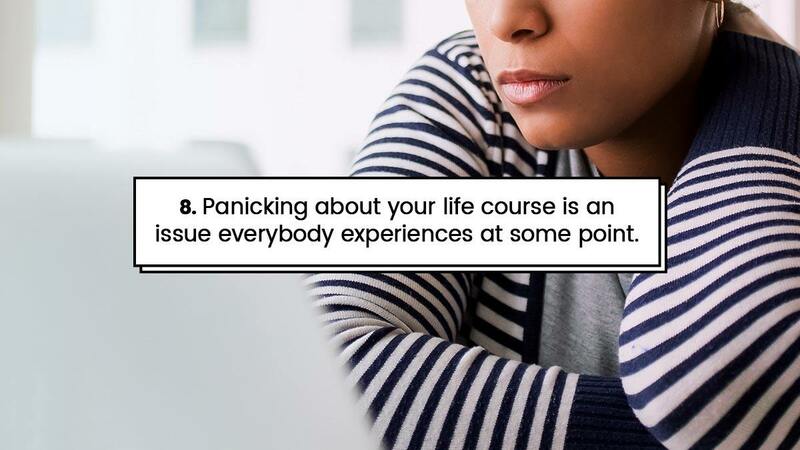 Panicking about your life course is an issue everybody experiences at some point. If you're stressing about your future, you're not the only one, according to Ben Edwards. "Remind yourself you're not alone, and actually, you are lucky enough to be questioning your choices at a time when there are many doors still open to you. The key to making those necessary changes without having a meltdown is becoming aware of the control you have over your life. You can do whatever you want, whenever you want." "Instead of focusing on what you are doing wrong, ask yourself 'What can I do now to make this situation better?'." By viewing your power from a more positive perspective, you will find renewed motivation rather than intense anxiety." Feeling a bit better about everything now? Same.